A castle and country park near Maybole on the coast of South Ayrshire, Culzean is one of Scotland's leading tourist attractions. Culzean Castle was built in 1772-90 by Robert Adam for David, 10th Earl of Cassillis. It stands on a dramatic cliff-top overlooking the Firth of Clyde on a site associated with the Kennedy family since the 14th Century. The Eisenhower Room in the castle commemorates General Eisenhower's links with Scotland. Surrounding the castle is parkland landscaped by Alexander Nasmyth (1758 - 1840). 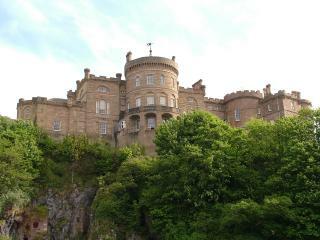 In 1945, Culzean was gifted to the National Trust for Scotland. The Eisenhower Room in the castle commemorates American General Dwight D. Eisenhower's links with Scotland and in particularly that part of the castle had been made available for his use in recognition of the help he had given the UK during the Second World War. In 1969, 228 ha (563 acres) of the estate were designated as Scotland's first country park. Since 1987, Culzean Castle has featured on the rear of Royal Bank of Scotland £5 notes.